Playgrounds. 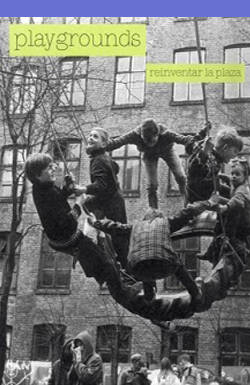 Reinventar la plaza [exh. cat.]. Madrid: Museo Nacional Centro de Arte Reina Sofía, 2014, 320 pages. Translated by Marta Pino Moreno. ISBN: 978-84-8026-490-7. Spanish translation of essays written by Lars Bang Larsen, Linda Nochlin, Lady Allen of Hurtwood, Beatriz Colomina, Aldo van Eyck, Pier Vittorio Aureli and Graham St. John, for an exhibition catalogue published by the Spanish museum of modern art Museo Nacional Centro de Arte Reina Sofía (MNCARS) on the concept of play linked to public space. Exhibition title: Playgrounds. Reinventing the Square. MNCARS, 30 April  22 September 2014.